Chris Robinson catches up with former WBC light heavyweight champion Jean Pascal (28-2-1, 17 KO’s) in Big Bear, Calif., as he speaks on the recent buzz created by WBO champion Sergey Kovalev. 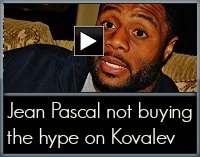 In this clip, Pascal reveals why Kovalev isn’t fully tested and claims that he is the division’s cash cow. Click on the thumbnail for more.